Stinking Iris, Scarlet-berry Iris, Gladdon, Gladwin Iris, Roast-beef Plant, and Stinking Gladwin. Some of this plant's common names come from the smell of the sword-shaped leaves when they are crushed or bruised - a smell that is said to resemble rotten raw beef. This impressive monocot is locally common in southern England, Wales and in the south-eastern part of Ireland, where it blooms from May until July. It is one of just two Iris species native to Britain; the other is Yellow Iris, Iris pseudacorus. 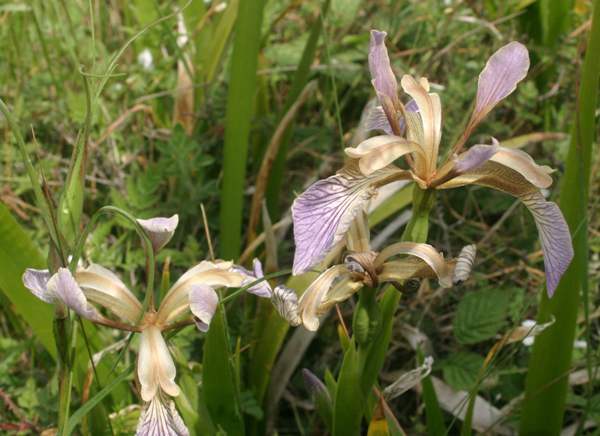 Stinking Iris can be found in scrub and woodland areas, but in Wales the best place to see this is to head for the sand dunes in south west Wales, where it is fairly easy to find. Stinking Iris favours calcareous substrates, and sand dunes containing a high proportion of crushed shells provide an ideal habitat. 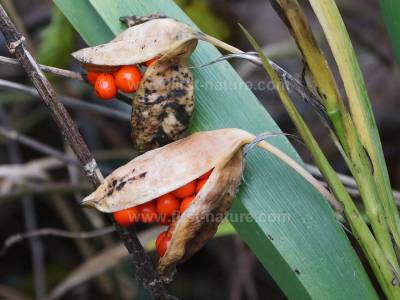 The flowers themselves are beautufully veined but in other respects far from spectacular; however, Stinking Iris steps up a gear during autumn, when its seed capsules open to reveal striking red-orange berries that cling to the dead flower stems all through thw winter. The plant grows to around 60 cm in height, and the flowers, which are a dull mauve and fawn colour are large - 7 to 8 cm wide. 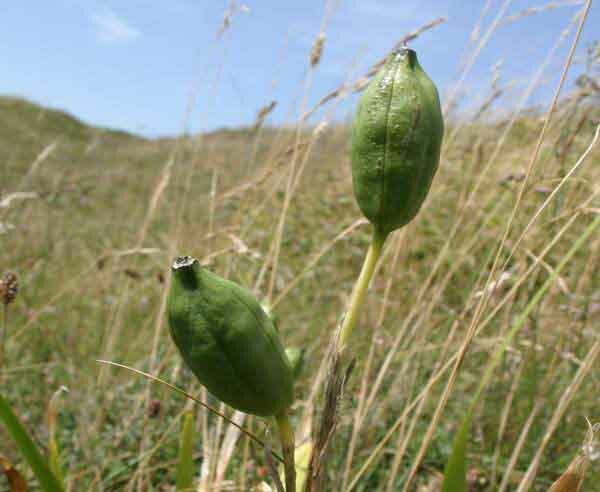 The fruit capsules are oblong and three-sided. When ripe they split open to reveal orange seeds - the picture above was taken in southern England by Greg Whitear. The other pictures on this page were taken in Kenfig National Nature Reserve in South Wales.